Cost and logistical constraints can be barriers to the inclusion of small-scale farmers in aquaculture certification schemes. Adopting a cluster-based approach, where groups of adjacent farms are certified together, can facilitate the participation of small-scale producers maintain their access to markets. Group-based certification can also assist with extension and implementation of better management practices required to achieve certification and compliance monitoring. International requirements on food safety, traceability, animal health and welfare and social responsibility are increasingly stringent. The burden of compliance and the cost of certification are particularly heavy for small scale farmers who are often excluded by the limited resources at their disposal. Working in groups can help small scale farmers attain economies of scale necessary to address compliance issues and participate in certification schemes, improving their competitive position. 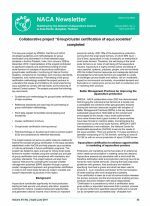 Collaborative project "Grouper/cluster certification of aqua societies" completed. Report of the Advisory Group on Aquatic Animal Health available. 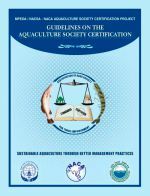 Guidelines on Aquaculture Society Certification released. Listen to us online. Workshop on ecosystem approach to inland fisheries: Data needs and implementation strategies. Disease advisory: Infectious myonecrosis (IMN) status and threat. 7th Regional Grouper Hatchery Production Training Course, 25 September - 15 October, Situbondo, Indonesia. These guidelines prepare and enable aquaculture societies to seek group certification from independent third party certification programmes. The guidelines are independent of commodity and certification standards. They were developed as part of a collaborative MPEDA/NaCSA/NACA project on the certification of aquaculture societies. Draft guidelines developed by the project partners were discussed at the inception meeting on aquacutlure society certifiction held at Kakinada during 1-2 September 2009. Certification schemes for both wild and farmed products are gaining market share in many developed country markets. In a not too distant future, aquaculture’s share of total supply for human consumption will rise to somewhere between 60 and 70 percent. This will have a profound impact on the sector’s ability to shape world markets but it will also challenge the sector’s ability to respond successfully to evolving consumer needs. As standards, certification schemes and claims proliferate, their value is being questioned. Producers and producing countries in particular question whether these private standards and certification schemes duplicate or complement government work, especially in relation to food safety and animal health. The expert panel will review current practices and future trends in market-based quality standards and certification schemes in aquaculture, including international initiatives to promote transparent market standards for improved safety, quality and sustainability in aquaculture. There is unprecedented growth in the demand for organic food and new areas of organic food production, such as fish, are proving increasingly popular. Today, several specific and relatively precise standards of organic aquaculture production (hatchery, feed, grow-out) and processing exist which aim at achieving optimal agro-ecosystems which are socially, ecologically and economically sustainable. Around 80 different organic aquaculture standards exist, both public as well as private. Presentation of the summary, conclusions and recommendations of Thematic Session 4 (Responding to market demands and challenges; making aquaculture a safe and diverse food producing sector for the benefit of world consumers). The Phuket Consensus is a declaration on aquaculture development endorsed by participants of the Global Conference on Aquaculture 2010, held in Phuket, Thailand, 22-25 September. 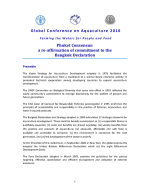 The consensus builds on the Bangkok Declaration, which was formulated at the International Conference on Aquaculture in the Third Millennium, held in Bangkok, 20-25 February 2000. The consensus and declaration provide strategic guidance on sustainable development of aquaculture considering social, environmental, technical and economic issues. 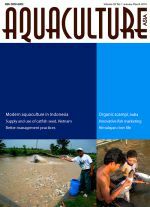 Development of modern aquaculture in Java, Indonesia. Better management practices - gateway to sustainability. Update on organic scampi aquaculture in Andhra Pradesh. Domestic fish marketing in south India. Seed rearing of catfish Clarias batrachus. Supply and use of catfish Pangasianodon hypopthalmus seed in the Mekong Delta. Risk analysis and sustainability of catfish seed in the Mekong Delta. Life of a river in the Himalaya: Ecological study of the Trisuli River, Nepal and more.